Perhaps one of the most interesting things for consumers that came out of Microsoft Build 2018 was Chief Designer Joe Friedman's presentation on past company failures. Friedman spent roughly 15 minutes detailing some of the more interesting concepts that Microsoft produced in the past, most of which never saw the light of day. There was some speculation prior to Build that Microsoft may at least tease the rumored Andromeda device, but this proved to be false. Naturally, Build focused mostly on developers rather than consumers. However, those interested in a future "Surface Phone" did get some background from an official source on what many consider to be the device's precursor: Microsoft Courier. Now, the Courier device never made it out of the concept phase. It was intended to be a digital journal, with dual screens and a stylus. 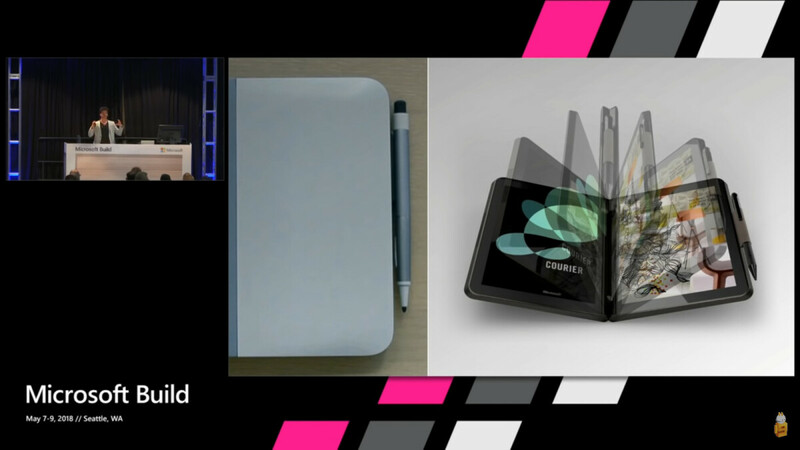 The device was supposed to be aimed at the creator market and bridge the gap between paper and PC, according to Friedman. Many of the features are now implemented elsewhere in Windows 10 but do not come together in the way they would have in Courier. It would seem that the device was before its time and many of its core concepts are now a focus at Microsoft. This is clear with the Surface line of products and the way Windows Ink is making its way throughout the platform. That is why Andromeda is believed to be a second shot at Courier with a bit of a twist. What happened to Microsoft's Courier project? Well, in short, then-CEO Steve Ballmer canceled the project. According to Friedman, he had been charged with running an incubation team inside Xbox to design a social mobile phone called Kin. At the same time Microsoft was changing the way it approached Windows Phone and although the device hit the market, it did not last long. In any case, he was successful in integrating different aspects of the team, so he was given another incubation project around the same time. This was Courier. For the device, he put together a brand new team and they apparently put alot of effort into designing it. Ballmer terminated the project, much for the same reason why Kin was killed off. Microsoft seemed to be going in a million different directions and the company was trying to focus itself. Courier did not have a focus on developers. The company was trying to take Windows as a whole in a new direction. It wanted to focus on building a platform that brought in developers and to have that platform be the basis for all of its devices. According to Friedman, Courier lacked both a developer angle and a platform angle, so it was nixed. Joe Friedman starts off discussing Courier by saying, "Courier was a little bit ahead of its time and we were a little bit off-kilter on how we approached this." As we mentioned before, Microsoft has definitely moved in this direction and numerous patents have appeared showing essentially an updated version of this device. Without assuming too much, perhaps Friedman knows it is the right time for such a device. Many of the reasons for killing off the device have since been remedied (think Windows Core OS), and perhaps the Surface line of products successfully tested the waters for another such device. For many of us tablet aficionados, the hope for Courier was that it would be a portable full Windows device, an upgrade from the Windows XP Tablet Edition OQO 02 which Ballmer showcased in a previous Microsoft Keynote. The key, to us, was a full Windows experience that was light (under a pound) and pocketable (under an 8" screen) and used a CPU that didn't ultimately fry the motherboard (unlike the OQO 02). Unfortunately, Andromeda seems to be going in the direction of a big phone rather than a small Surface.